[ACT](VC) Limit Break 4 (This ability is active if you have four or more damage):[Counter Blast (2)] This unit gets [Power]+3000 until end of turn, and search your deck for up to two cards named "Covert Demonic Dragon, Magatsu Storm", call them to separate (RC), shuffle your deck, and at the end of that turn, put the units called with this effect on the bottom of your deck in any order. 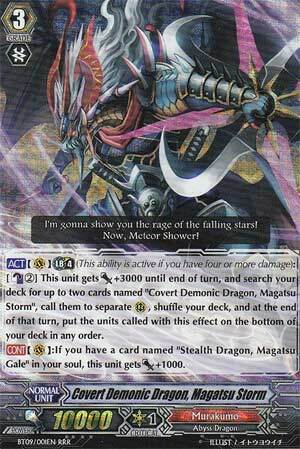 [CONT](VC):If you have a card named "Stealth Dragon, Magatsu Gale" in your soul, this unit gets [Power]+1000. At the top of the first Murakumo ride chain, we find Magatsu Storm. Like most grades three units that comprise a ride chain, Storm is an 11k while the grade two is in soul. The limit break is really what we are interested in; counterblast two, boost Storm by 3k and call out two copies of Storm that go to the bottom of the deck at the end of the turn. This is actually a pretty potent ability. You can fill up your rear guard with free units, and your vanguard gets to be 13/ 14k for the turn. This is a great ability to use if it’s near the end of the game and it’s more important to conserve your hand; you can make free attackers each turn without using your hand. The trade-off is that you won’t have any rear guards in the front row on your opponent’s turn and you’ll suffer a few consequences, such as not having interceptors, and possibly falling victim to the number of “if you have more rear guards than your opponent” effects your opponent may control. In theory, the Magatsu chain is really good, and fits the Murakumo copy jutsu theme quite well. It’s just too bad that Storm wasn’t given a minor rear-guard-only skill, knowing that he will end up in the rear guard in just about every game. Rating: 5/5 – Ride chain or not, the Magatsus can apply a lot of late game pressure.